*The first Sea Kayaking Expedition from Japan to South Korea has been successfully completed. We returned to Japan on the 17th of July. Coastal pollution is a growing problem in Japan but it remains hidden by the many people who selflessly clean the beaches so we do not see the magnitude of this issue. – – – When we can walk on a beach and see a rusted refrigerator, a television, and hundreds of PET bottles, something needs to be done. This trip began as an impossible dream to raise awareness about this increasingly growing environmental concern and embark on a never-before-attempted 124mile journey across the Sea of Japan on an 20ft human powered boat. When I first arrived in Yamaguchi, Japan in June of 2012, I was pleasantly surprised at see how clean the city was and the scrupulous detail that is given to separating trash as compared to my home town of Philadelphia, PA, USA. Living in a city that often neglects recycling and the sight of trash being thrown out car windows is a daily occurrence; being a resident of Yamaguchi was a breath of fresh air. The first chance I had, I asked my students about the most beautiful coastal location in Yamaguchi Prefecture. Without hesitation, my students recommended Tsunoshima Island, and that single recommendation was the impetus for everything from the first trash art show and beach cleanup to this kayak expedition to South Korea. When I first arrived on Tsunoshima Island, I was stunned by its outward beauty and crystal blue water. Although I arrived in early November, the slight chill in the air and sunlight reflecting off the ripples in the water made the experience even more majestic…until I walked on the beach. After leaving my car and walking towards a grassy path leading to the beach, adjacent to the lighthouse, a large rusted structure lying high on the rocky beach caught my eye. I began walking down a small hill and immediately noticing a surprisingly large amount of trash was literally blanketing the upper portion of the beach, visibly washed up from the ocean. 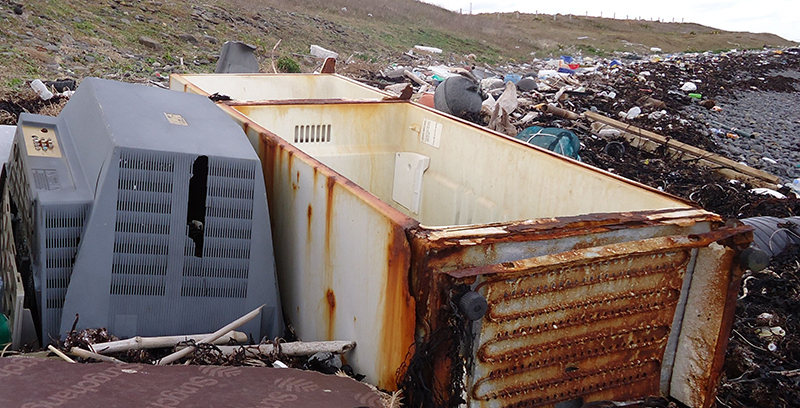 This large metal object began to take shape and reveal itself as a refrigerator with a large television at its side. I was aghast and after inspecting the refrigerator and television, the true magnitude of the problem began to sink in. Thousands of PET bottles and countless other items began to destroyed any positive image I held for this coastal treasure. I could not believe what I was seeing and knew something had to be done immediately. Because I did not speak Japanese and did not have any resources to collect trash I began taking pictures of this atrocity (Flickr Page) and posted them on a website I created. Within a few weeks and many shares on Facebook, the number visitors peaked in the thousands. With growing support in the local community, I hosted my first art show made up entirely of beach trash from Tsunoshima (Studio Imaichi Show). Over 100 people attended during the two day show. The following week we hosted the first beach cleanup, which 14 community members attended. Support for this cause continued to spread in the community and with the help of many people, we created a beach cleaning and beach trash art organization called Life Recycled (Tsunoshimatrash.com) and have already hosted 6 beach cleanups, 5 art shows and placed in the top 80 of 500 entries in a Yamaguchi Prefectural art competition, as well as a community event at a local elementary school, with many more to come. At this point, I started to think about ways to foster a national focus on this environmental concern. I realized that cleaning the beach for countless decades, and hiding the problem from the summer tourists, was the likely outcome if something unorthodox and large was not done. In my search for activities or events that could raise awareness about this issue, I was also simultaneously becoming fascinated with ocean rowing. The two ideas started to come together and one day I had the crazy idea to kayak across the Sea of Japan from Tsunoshima Beach to the port of Busan in South Korea. With this trip I hope to nourish the understanding that this is not a specific countries problem but representative of a larger issue of environmental degradation. It needs to be addressed as an international issue. 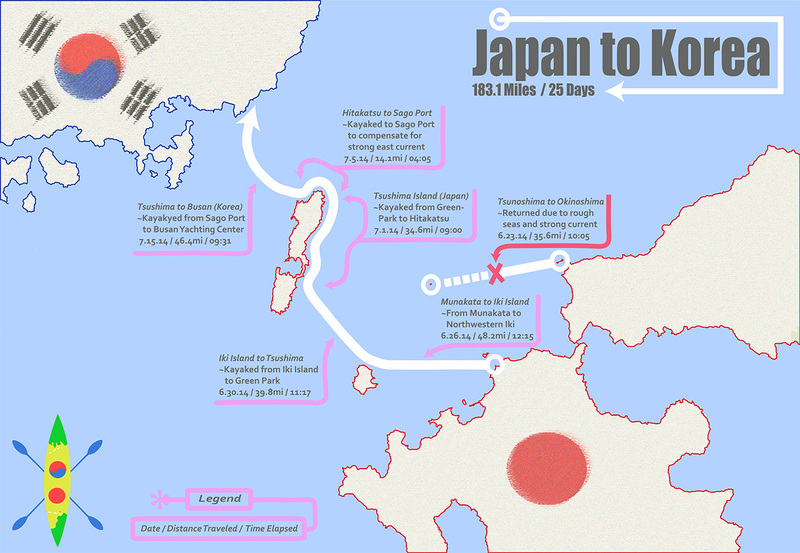 Also, South Korea has been a partner is cleaning Japans beaches and joins a yearly beach cleanup on Tsunoshima Island. Although, many supported the concept of an international response to this problem, this idea was still met with a barrage of negative feedback; “that’s impossible” and “you will die” was the most common response from everyone I shared this idea with. Some of their concern seemed warranted because of my previous breadth of experience, which lasted a full two days while whitewater kayaking in Pennsylvania, may have not adequately prepared me for a 124mile crossing of the Sea of Japan. After some months passed and I began to accept the impossibility of this dream, the desire to embrace this challenge was reignited and fueled by my life long quest to dance with the impossible and embark on something that may actually make a difference. Although, I may be crazy, it was my dream and I could not let someone else tell me it was impossible. If it was in fact impossible, I wanted to find out in the ocean on my way to Korea in a Kayak but to my surprise I found the one man who didn’t think this was such a crazy idea. The training regimen includes weekly skills and endurance exercises focusing on distance training of approximately 30-40 kilometers per training day with incremental increases up to 70km per training day. Koji also instructs me in weight training 3 times per week. This event will be advertised at various event in the Yamaguchi, as well as presentations in Yuya, Shunan, and Yamaguchi City at N3 Art Gallery. I am excited about this expedition. Please email me the date, cost and all necessary details soonest possible. Many thanks. Congratulations, Mike. Outside of the video you did a couple of weeks ago (about the cooler) this is the best thing you’ve done. Before this what I saw was a smattering of photos, videos and one sentence tags. From a distance I didn’t see how all of this was coming together. But this puts everything into perspective. I now know the background, the vision, how all the work you have been doing (trash pickups, art shows and the kayak trip) fits together. You’ve done well and will continue to do well on this project and more. I wish you all the best! I just wish I lived closer ’cause I’d be out there with you (cleaning up trash, not kayaking). Stay safe! Hey Dan, Thanks for the comment. I’m glad this could shed some light onto the actual motivation for our trip.